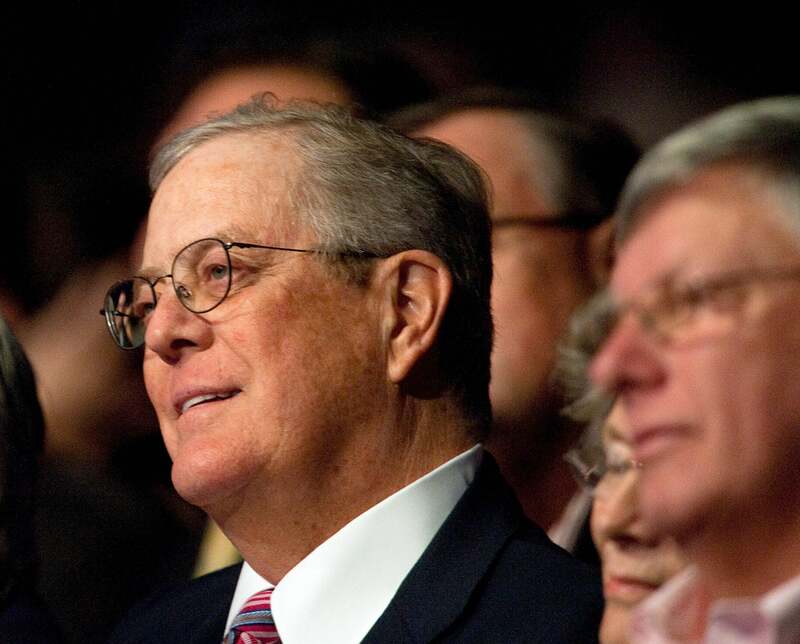 Koch brothers, Kronies: Helping mainstream Republicans, not just rebels. David Koch spreads joy across the land. Moody reports that the sort-of-viral 1980s action figure parody, The Kronies, “grew out of Public Notice, an advocacy group and polling firm that’s part of a sprawling political advocacy network overseen by billionaire activists Charles and David Koch,” but the campaign attempts to hide that—it claims, as a joke, to be a product of Chimera Inc. “Chimera Incorporated has worked together with our partners in Washington to become officially too big to fail,” reads the ad copy. “As a result, your investments in Chimera are ultimately backstopped by the American taxpayer.” Rimshot! But why were they secret? That’s obvious—too much heat on the Kochs. Moody and I both remember a time when the Kochs could make it rain on libertarian institutions and the media didn’t care. (He worked at the Cato Institute, I worked at Reason.) Now, being “Koch-connected” is a recipe for being denounced by Democrats. Wealthy Republican donors fear, more than ever, being targeted by the IRS. The Koch network is massive—we knew that—but it’s also becoming an unalloyed good for Republicans. Americans for Prosperity has spent $23 million this cycle on TV ads attacking Democrats in swing states, on Obamacare. This week it annouced that it would join the Club for Growth on the air in Arkansas, to soften up Sen. Mark Pryor. During the 2012 campaign, Republican leaders counted on Crossroads Grassroots Policy Strategies, the nonprofit arm of Mr. Rove’s group, to soften up Democratic candidates by financing issue ads in the early campaign season. Now that job is falling largely to Americans for Prosperity, which has been critical of Republican leaders’ strategy on issues like the debt ceiling. But the Koch network is not like the Senate Conservatives Fund or Tea Party Patriots or other “rebels.” It is not raising money by promising to beat “RINO” Republicans in primaries. It’s not spending a cent against Republican incumbents. It did not call for the government shutdown. It is amplying the preferred Republican message, appealing to Republican mega-donors and to libertarians uncomfortable with the main party. That’s why it’s so powerful this year. That’s why it’s secretive even when the secrecy invites bafflement.